Still, the sound of the spring reverb is indelibly grafted into our musical race-memory; it’s played an integral part in defining the guitar sounds of many a legendary rocker; and it’s found its way onto countless synth and keyboard tracks too, courtesy of that same reverb-in-an-amp route. Nowadays, spring reverbs are a bit of a niche product. But we have a kind of indefensible soft spot for them. 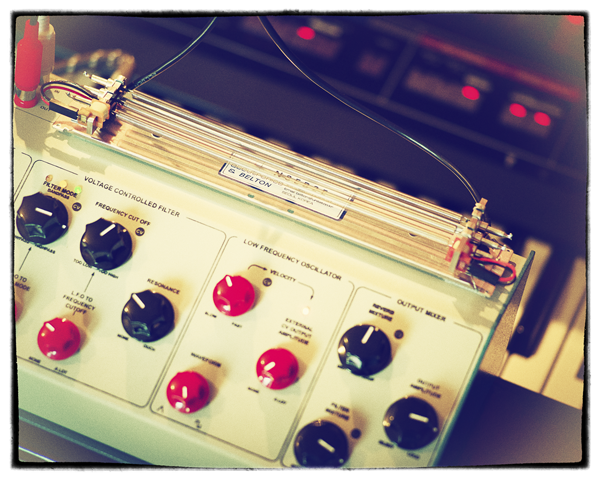 And our absolute top-notch fave has to be the Ekdahl Moisturizer – a spring reverb built to be abused, with its three springs all exposed so you can get at them, plus a multi-mode filter and LFO built right in. 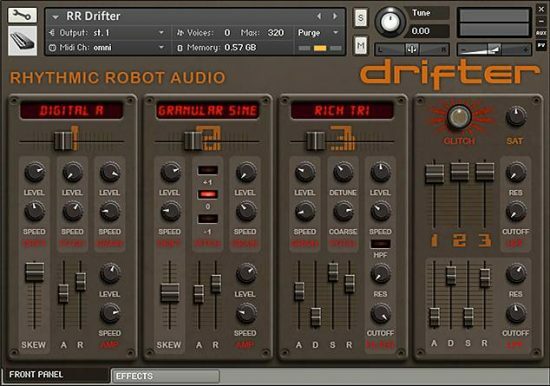 This thing isn’t designed to add tasteful hints of reverb to your tracks… it’s built for sound design and sonic mayhem, and it forms the core of SpaceMan. 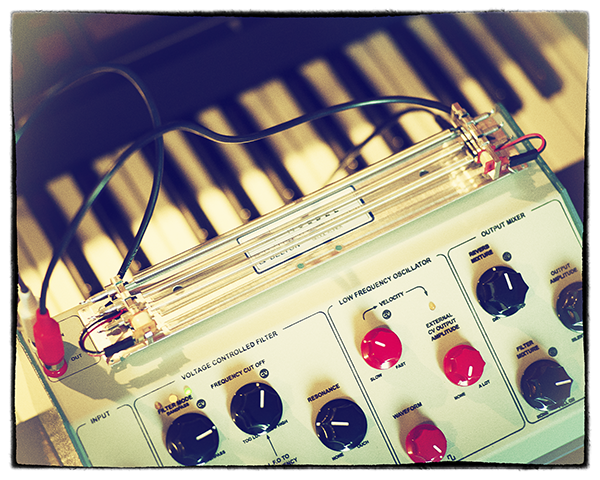 SpaceMan is what would happen if you built a synthesiser out of springs. Seriously. Imagine if every note of your synth, instead of triggering an electronic oscillator, started oscillating a spring to a set pitch: that’s the core of SpaceMan. We used the same E-Bow guitar techniques we incorporated in Uproar only this time we used them in conjunction with the Moisturizer’s inbuilt filter to generate some erratic, wobbly, springy core waves. With around a minute’s worth of sampling per note, and randomised start points, these waves are wonderfully unpredictable and you dial them up using the Spring Tank Oscillation Level knob. The basic sound is of course heavily reverberant, metallic, uneven and, er, springy. Then we turned to the Dark Side for a bit, using brushes, bows, fingernails, screwdrivers, rack bolts and cable ends to touch, jiggle, scrape and otherwise interfere with the three springs, while adjusting the filter to taste. This cruelty has also been looped and randomised and can be dialled up in three different flavours of Contamination: Type 1 involves scrapes, brushes and sustained contact sounds; Type 2 covers taps, touches and momentary contact sounds; Type 3 explores breath sounds, feedback and tonal components. These can be engaged individually or in combination, and have their own level control. 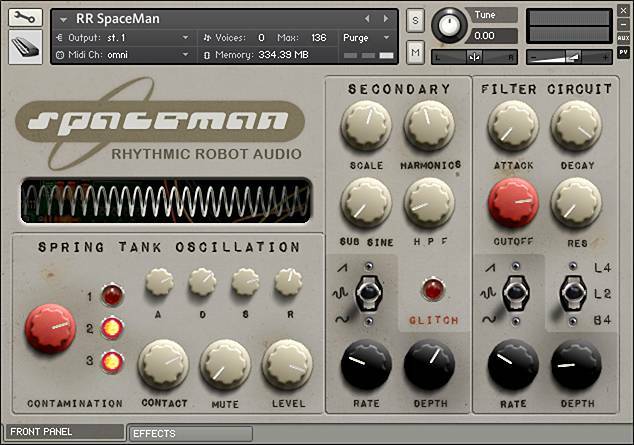 SpaceMan is intended for left-field atmospheric sound design, strange warbling rushes of reverberant noise, unique background textures, and synthesis with a very unusual sonic fingerprint. It sounds superb layered with conventional synths to add weirdness and complexity to staple sound; equally, it can bring colour and movement to a whole range of musical genres, including EDM, trance, soundtrack and ambient. Open the pod bay doors, HAL! (All our Kontakt instruments require a full copy of Native Instruments Kontakt v4.2.3 or higher (including all versions of Kontakt 5). Kontakt Player is not supported: instruments will load, but will time out after 15 minutes. See the FAQ for further information.) You can read more about the awesome Edkhal Moisturizer here. The thing that makes these sounds really lovely is the subtle contamination that sits just beneath the main sound. I liken it to those shimmer effects that reverb and pitch shifting outboard gear sometimes make. The stuff going on in the background is what makes them eminently listenable. 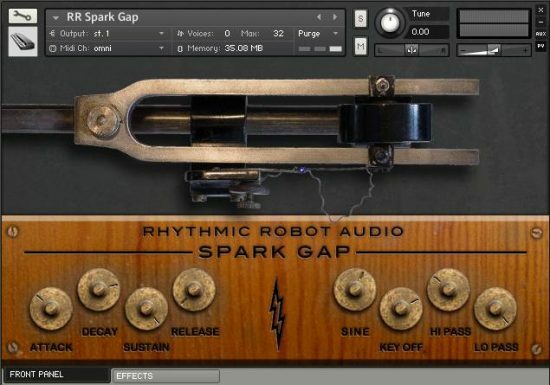 The sounds in this instrument are weird, but like most Rhythmic Robot stuff that I gravitate toward, they’re always charming and lovely, rather than brash and grotesque. This is strange noise served up in a musically pleasing context. This might just be the coolest most unique sounding synth I’ve ever heard! The sound is hard to describe, because there’s nothing else that sounds quite like this. The base spring oscillator is smooth sounding but with obvious metallic overtones and with a short-ish envelope setting you can get great EP like sounds from SpaceMan. Its strongest point is probably long evolving pad sounds, with the contaminations mixed in it can get the best sci-fi space sounds. If you close your eyes and play, this synth can make you feel like you’re stranded on a desert planet watching the two suns set! If I were to describe what this one sounds like, I would be perplexed, and just point to the demos, or just say “Buy it”. I find myself switching on all the contaminators for every “glitch” (because they are really cool), but I found out I needed some variation, so I made an nki with all the contamination groups set to Time Machine, so I could slow them down, and it made for a welcome change. The Chorus Phase knob doesn’t work at all, and all Chorus Rate does is set the rate to 2.2 Hz (if you’ve tweaked its corresponding knob under the hood). The small knobs on the Effects tab tweak the knobs next to them instead, if you don’t click them in the upper opposite side “corner”. I reported this to RR late 2017, so it should’ve been fixed now…? I love this thing. The one problem it bears–and really this isn’t a problem for someone who knows what they’re getting–is the same problem with actual springs: the overtones are complex and specific. Sometimes, if you’re not careful, you wind up in an atonal wonderland. This is great for soundscaping, scoring, sound design, etc. but in a song setting, I sometimes find myself fiddling with it a while, and then not using it. That said, I need to RTFM, and so should you. So buy it, but then learn from my mistake and figure out how it works. Brilliant instrument, very useful in my opinion specially when layered with other instruments to add a special vintage sci-fi flavour. So, if you’re reading this you already know that RR is the place to come to for quirky, unusual, retro VSTs, and SpaceMan doesn’t disappoint. Upon installation you’re presented with an interface that looks right out of the Cold War, with a useful selection of clearly presented dials and switches, and none of those hidden sub-sub-sub-menus of other overly complex VSTs. The main ‘Panel’ has the usual suspects of base oscillator, adjustments, envelope functions, filters, etc., all of which explain themselves when you run the mouse over them, so no need to go hunting the manual to decipher any cryptic alphabet spaghetti. The most fun of these is the ‘contamination’ section that lets you get the original spring tank sound dirty, nasty, and downright characterful. There’s also a ‘glitch’ button which randomises everything, often creating something useful in and of itself, or made so with a little intelligent tweaking. Under the ‘Effects’ tab there’s a chorus, phaser, delay, rotary, reverb, and five cabinets to choose from, all of which some with a few dials for further tweaking. To get you started the SpaceMan comes with 66 presets plus a base ‘init’ preset, a goodly amount of presets that shows off the capabilities of the synth and also don’t overwhelm you with 1000s of so-similar presets. So how does it sound? Wonderful. It’s capable of both sharp punchy hits and also longer evolving sounds, all of them sounding to me like something I’d’ve listened to over a shortwave radio in the 1960s or 1970s. It’s a great instrument for lofi sounding tracks that sound analogue, the kind of thing the early pioneers of electronic music would have used. 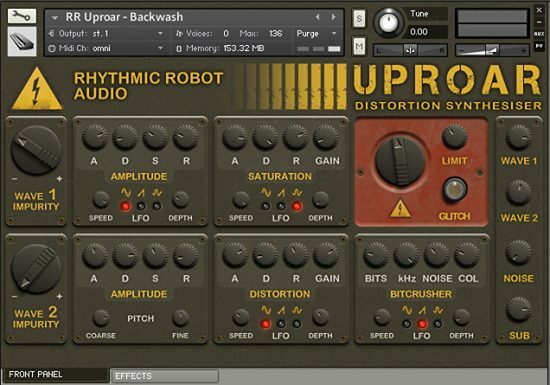 It works great as the main voice of a track, for characterful noises, or even for background ambiences. All in all, a great ‘zero day’ buy I’m totally happy with, and would cheerfully recommend to anyone who wants a retro synth that doesn’t sound like lots of other synths…but that’s why we’re here at RR in the first place, isn’t it? If you have gone this far into RR’s website you too are the kind of computer musician who enjoys dressing up your tracks with burbles, clanks, squeaks and the like. It was amazing good fortune for me to have discovered these guys a few years ago. I must now possess over fifty of RR’s creations. So what does a spring-based instrument sound like? Weird. Very weird. Like many of the other inventions you can find in the laboratory, you won’t be banging on SpaceMan and saying, “Wow, this sounds just like Eric Clapton’s guitar on Layla” or the like. So how will I use it? I have no idea, but eventually these laboratory devices all end up on my tracks. 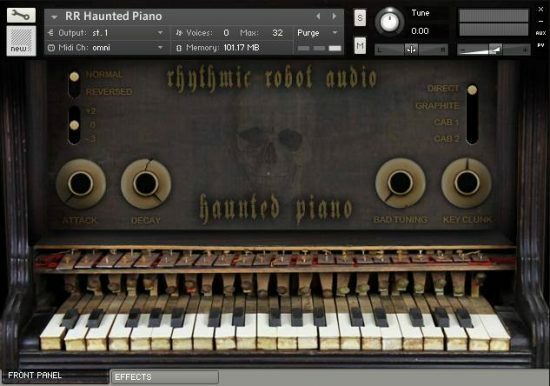 It’s certainly capable of making unusual pitched instruments as well as those bumps in the night to spice up your tracks. And let’s admit it: All of us here love to jiggle with all the controls available. Subtlety or the lack thereof are all in your hands. In the future I am hoping that Rhythmic Robot makes an all-in-one steampunk instrument that wheezes, coughs, whines, bangs, hisses, whooshes, clunks and othewise sounds like something Eric Clapton, dressed as pirate in some past wooden, wire and watery world, would jam with. Or Jules Verne. Until then, SpaceMan will fill a part of that weird void in my music-making that mere Les Pauls and Teles just can’t fill.